Ethnicity is a convenient but misleading way of explaining the outburst of violence in 2010. 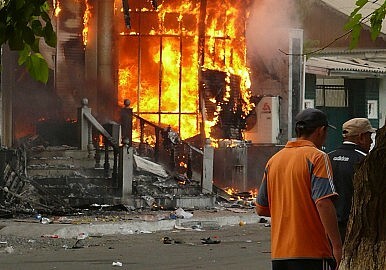 Late in the night of June 10, 2010, outside a casino in Osh a skirmish broke out between several groups of young men. A catalyst for greater belligerence, fighting continued through the night and by the morning Osh was in flames. The chaos lasted for days, with violence spreading to Jalalabad and elsewhere. This week marks the forth anniversary of those deadly riots, which sparked a wave of violence in Southern Kyrgyzstan’s Ferghana Valley. By August 2010, preliminary UN assessments estimated that 985,000 people had been affected by violence in the Ferghana Valley, resulting in 300,000 internally displaced. The International Crisis Group in late August placed the official casualty rate at 393 but Human Rights Watch quoted some numbers as high as 900. What caused such wanton violence in that summer of 2010? With headlines from the New York Times’ “Ethnic Rioting Ravages Kyrgyzstan” to the Guardian’s “Kyrgyzstan killings are attempted genocide, say ethnic Uzbeks” the cause seems clear: ethnic-violence. But that is a dangerous simplification, not least so because it presupposes ethnicity is monolithic. Ethnicity is a convenient but misleading way of looking at what happened four years ago in Kyrgyzstan. And yet, where it is convenient, the cause of ongoing conflicts continues to be superficially discussed as ethnic-tension. Recognizing this is especially important from a policy perspective because if ethnicity is not at the roots of these episodes of violence then an ethnic solution will simply be another nostrum. In March 2005, the Tulip Revolution brought an end to President Askar Akayev’s authoritarian reign. His fourteen years in power were marked by corruption, the absence of the rule of law, nepotism, and decreasing quality of life. In July 2005, Kurmanbek Bakiyev campaigned to eliminate corruption and improve living standards. He won the presidential election with a landslide 89 percent. Within a few years, however, his campaign rhetoric had proven hollow. The changes under Bakiyev were seen as an intensified version of Akayev’s despotism. Bakiyev consolidated power in a new Constitution, appointed family members to key positions, and sold vast amounts of national resources for personal gain, leading to severe energy shortages in the winter of 2007-2008, the coldest in 40 years. In April 2008, after two days of popular mobilization, Bakiyev’s short-lived dictatorial reign came to an end but the country, impoverished by years of corrupt rule, was left with a political and security vacuum. Tensions erupted on the evening of June tenth when groups of unemployed young men got into an argument outside a small casino in Osh. The violence escalated. Independent observers and human rights organizations quoted witnesses who claimed that security forces responded differently depending on the ethnicity of the perpetrators, that plain clothed security officials were seen distributing weapons to Kyrgyz men or protecting roving mobs. The local government, a long-time supporter and ally of the ousted Bakiyev, claimed that Uzbeks were committing atrocities while Uzebks reported being targeted by violence. Arbitrary detentions, disappearances, and torture in custody were reported. While much of the violence was perpetrated along ethnic lines, the OSCE High Commissioner on National Minorities, Knut Vollebaek, noted the challenges were not confined to interethnic relations and pointed to the significance of disillusionment with the state and feelings of economic and personal insecurity. Indeed, along these lines Kyrgyzstan was very insecure. In 2008 the official minimum wage was 340 som ($6.45) per month, yet the government estimated that the standard statistical “basket” of goods and commodities cost on average 3,354 som per person per month. Following global increases in basic commodity prices, 2007 saw a 23.5 percent increase in food costs and 2008 an increase of around 20 percent. By 2010, around 43 percent of the population lived below the poverty line, with an unemployment rate of 18 percent. Many families responded by sending off working-age sons to work in Kazakhstan and Russia, and China to a lesser extent, a palliative for economic woes but destabilizing for traditional family structures. The Economist reported that almost 22 percent of GDP was generated from migrant laborers, with as many as 500,000 in Russia alone. High levels of unemployment and economic uncertainty often result in illegal economies. The UN Office on Drugs and Crime routinely cites Osh as a regional hub for narco-trafficking, which decreases food security through the loss of croplands, environmental security through deprivation of soil and toxic chemicals, and personal security through gang violence. Disillusionment with the state among certain demographics facilitated the rise of criminal groups who seized land and extorted protection money. The continued asymmetric protection of personal security institutionalized those groups and had a negative impact on social tensions and perceived inequalities. But why did these tensions erupt along ethnic lines? The Ethnicization of Insecurity and Competition? Historically, the Ferghana valley was inhabited by sedentary Uzbek traders and farmers. The Kyrgyz tended to be nomadic. Soviet control irrevocably altered traditional structures of communal power through Korenizatsiya: the policy of local administration initiated under Stalin where titular nationalities – here the Kyrgyz – were elevated to positions of power not necessarily previously held by such groups. Later, as Soviet regional authority waned, Human Rights Watch explains “grievances over land and water distribution increasingly took on an ethnic dimension during the perestroika and glasnost era in the mid-to-late 1980s, as ethnic, linguistic, and cultural identities became stronger.” Eventually grievances over territory and resource access culminated in a violent outbreak in Osh in 1990. On the eve of the Soviet Union’s disintegration, precipitated by the vacuum of Kremlin control, an Uzbek group called for the establishment of an autonomous region to address concerns that their needs were routinely subjugated to those of the Kyrgyz. The ensuing conflict left more than 300 dead. KGB reports at the time, cited by the Crisis Group, noted perceptions among poorer Kyrgyz that the Uzbeks had become too prosperous. Meanwhile New York Times coverage was noting Uzbek frustration at the pro-Kyrgyz allocation of land for housing. This lead to what political scientist Paul Brass has called an “institutionalized riot system,” where ethicized violent mobilization in response to perceptions of unequal access to basic human needs became part of the repertoire of popular mobilization. If anything, the perceptions of unequal access that sparked violence in 1990 only intensified under the policies of corrupt leadership in the following decades. Under Bakiyev, employment in the public sector was skewed in favor of Kyrgyz language; fluency was a prerequisite for state employment. The education system did not require Kyrgyz fluency for Uzbeks, Dungens or Uyghurs, who were largely barred access to state employment and sought to make their livings in the private sector, fueling accusations that minorities got rich at the expense of the Kyrgyz. However, a Eurasianet article published on the first anniversary of the 2010 violence cited Uzbek feelings of alienation from both political and economic life. The April 2010 rebellion prompted Kyrgyzstan’s neighbors to close their borders. The de-facto embargo from Kazakhstan, Uzbekistan and China caused severe economic concerns for those who relied on cross-border trade, agriculture, fuel and food imports. Border closure lead to sudden unemployment and deprivation, while perceptions of economic and political inequality stoked the growing tensions. Nowhere were tensions more noticeable than in the Ferghana Valley. After his ouster from Bishkek, for a time Bakiyev returned to his hometown in the South, where he attempted to mold tensions to retake the capital. To counter Bakiyev’s support network and stabilize provisional authority, the interim government under Roza Otunbayeva reached out to elites within the Uzbek population in the South. Anthropologist Gerd Baumann asserts that ethnic identity is often found in the social processes of maintaining boundaries between groups who perceive these boundaries as ethnic. In this sense the Kyrgyz were political players and the Uzbek were business players. These boundaries were drawn as much along class and community lines as along ethnic lines argues anthropologist and Central Asia scholar Madeleine Reeves. At the time, she observed that the oft-reported targeted violence should have been balanced by cases where ethnicity was irrelevant, such as when property was looted because it represented inaccessible wealth and opportunity to the looter or when mixed neighborhoods established self-defense groups from attack not because of shared ethnicity but because of shared feelings of community. Bakiyev had created rifts in the South for political leverage, which were widened when the interim government called for Uzbeks to be included in the traditional political boundaries of the already economically and socially threatened Kyrgyz population. Longstanding hardships exacerbated by border closures further strained society and threatened human needs. These factors created a violent atmosphere prone to manipulation by elites. Because economic, political and community boundaries had mostly been demarcated along ethnic lines the violence took on an ethnic quality that was not actually at its roots. Ethnic violence was a more proximate factor; the ultimate causes of the conflict were serious economic, political, and social insecurity combined with competition. Revisiting the causes of the violence in the Ferghana Valley in 2010 and questioning the narratives of ethnic tension can yield a transferable understanding to other contemporary episodes of conflict. It is a lesson perhaps particularly valuable in geographically close Xinjiang, for example, where a violent encounter near the Chinese border between a group of Uyghurs and a Kyrgyz border patrol left 12 dead at the end of January 2014. Regardless of the motivation of this group of Uyghurs, as militants or refugees, their illegal entry into Kyrgyzstan was undoubtedly spurred by insecurity in Xinjiang, a conflict that is increasingly characterized along principally ethnic divisions but one that could certainly benefit from a more nuanced examination. Michael Caster is a researcher and civil society consultant, specializing in nonviolent civil resistance and contentious politics in Central and East Asia. The government has made little progress in bridging divisions, especially with its troubled South.